South America is an amazingly diverse continent full of adventure just waiting to be had. I, Garrett Cooper of Feral Human Expeditions, took my first trip to Latin America on my motorcycle which I had ridden for seven months, covering 21,000 miles from Oregon to Tierra del Fuego at the southern tip of South America. Over the course of this trip I spent time in some of the highest mountains in the Americas, the driest desert in the world, salt flats that go on forever, and stunning coast lines. I was amazed by every environment I found but none held my attention quite like the jungle. I have led or participated in a variety of expeditions to the Amazon but at Feral Human Expeditions we understand that not everyone wants to participate in a true expedition style trip to an unfamiliar environment. We also don’t want you to miss out on experiencing some great jungle which is why we made Peru: A Lodge Based Jungle Experience. We work with a lodge that works with local communities and conservations of the surrounding areas which allows us to have access to beautiful jungle, knowledgeable local guides, good food and a dry bed at the lodge. In my opinion, people are an important part of any international travel and you would be remiss to pass up the opportunity to get to know them. We round off the trip with a night at the home of a local family where we’ll stay in cabins, and partake in a few activities around the city of Iquitos. Being completely immersed in this environment has visitors falling in love with the Amazon. The cultures throughout the Amazon are nearly as diverse as the flora and fauna around them. An important aspect of this cultural diversity is the indigenous population throughout the Amazon. In Matis: An Amazonian Indigenous Experience, we bring our group into a world apart from your own as we camp with a group of indigenous Matis for several days. My first time with the Matis was an incredible experience. 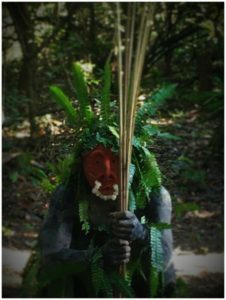 I followed hunters through the jungle as they used poisoned darts and 12-14 ft. long blowguns to kill their prey. I watched and even participated in several ceremonies and dances, and learned some of their beliefs about the world around them. The more I got to know these amazing people, the more I was awe struck by their skill and knowledge of the jungle. They are friendly and welcoming people who have not lost their identity to the changing world around them. The Matis are the real deal, and on this tour you’ll have the chance to see it for yourself. As you might have guessed, South America, particularly the Amazon, is an important part of my life. In the Amazon I will never run out of jungle to explore, rivers to paddle, people to meet, animals to find, and plants to learn about. Now it’s your turn to experience it. This is a land of adventure, come with us and have your own.